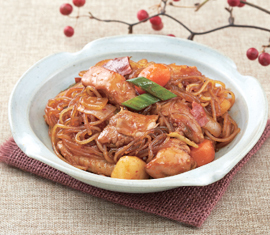 Chopped chicken is braised in a soy sauce-based seasoning with vegetables and glass noodles. This is usually called “Andong jjimdak,” as the dish originates from Andong in Gyeongsangbuk-do . ① Cut chicken into 5 to 7cm chunks and remove unwanted fatty portions. Blanch chicken in boiling water with cooking wine and rinse thoroughly in cold water, then drain. ② Cut dried chilies about 2cm long with cooking scissors and remove seeds. ③ Peel and cut the potato into 3cm cubes (rounding edges) then rinse in cold water to remove starchiness. Cut the carrot in the same way and parboil both potato and carrot cubes. ④ Slice the green onion diagonally. Cut onion and cabbage into bite-sizes pieces. ⑤ Soak the glass noodles in lukewarm water. ⑦ Marinate blanched chicken for 30 minutes. ⑧ Oil a pan with 1 tbsp of sesame oil and stir-fry dried chilies on medium heat. ⑨ Simmer marinated chicken with marinade on high heat. Add 3,4,5 and braise on medium heat until all ingredients are well seasoned. When potato is cooked, add 1 tbsp of sesame oil and sesame seed then mix once before serving.